Democrat Compares Jared Kushner’s WhatsApp Use to Seeking Russian Back Channel: What’s He Trying to Keep ‘Secret’? World Jared Kushner Jared Kushner’s alleged use of private WhatsApp messaging to conduct official business is reminiscent of his previously reported attempts to set up a secret back channel to speak with Russian officials before President Donald Trump’s inauguration, a member of the House Judiciary Committee said. 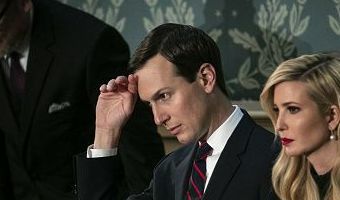 On Thursday, a key House Democrat sent a letter to the White House's legal counsel expressing concern that Kushner, Trump’s son-in-law and adviser, had used personal email accounts and WhatsApp to conduct government business. “During a meeting with Mr. Kushner’s attorney, Abbe Lowell, Mr. Lowell confirmed that Mr. Kushner has been using the messaging application WhatsApp as part of his official White House duties to communicate with foreign leaders,” reads the letter from House Oversight Committee Chairman Elijah Cummings, a Democrat from Maryland, to lawyer Pat Cipollone. White House senior advisers Jared Kushner and Ivanka … [Read more...] about Democrat Compares Jared Kushner’s WhatsApp Use to Seeking Russian Back Channel: What’s He Trying to Keep ‘Secret’?